Delve into the rich content of historical South Carolina newspapers dating from 1836 to 1922 through suggested topics, important dates, interesting articles, and tips for searching. For more information about this program, visit our SCDNP homepage. Visit the SCDNP Blog for more info on the program and to read in-depth articles on S.C. history. 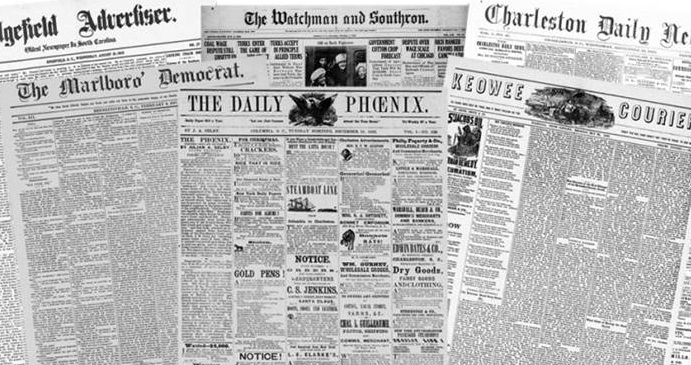 Access millions of digitized newspaper pages from historical newspapers across the U.S. Select a blue marker to view a list of newspapers digitized in that community. University of South Carolina Libraries and the South Carolina Digital Newspaper Program (SCDNP) has digitized over 300,000 pages and 100 historical South Carolina newspaper titles, ranging in dates from 1836 to 1922. SCDNP has made these selected historical newspapers freely accessible and full-text searchable through the National Digital Newspaper Program (NDNP) , a grant project funded and supported by the National Endowment for the Humanities (NEH) and the Library of Congress (LC). You can access these newspapers for free in Chronicling America: Historic American Newspapers . For more information, visit South Carolina Digital Newspaper Program (SCDNP).